Brian Knights talks about a new “green” utility truck. 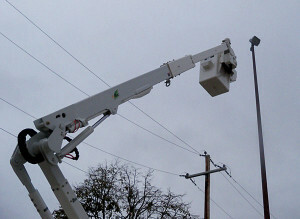 An Iowa utility company is moving to battery power in some of its trucks that fix power lines. 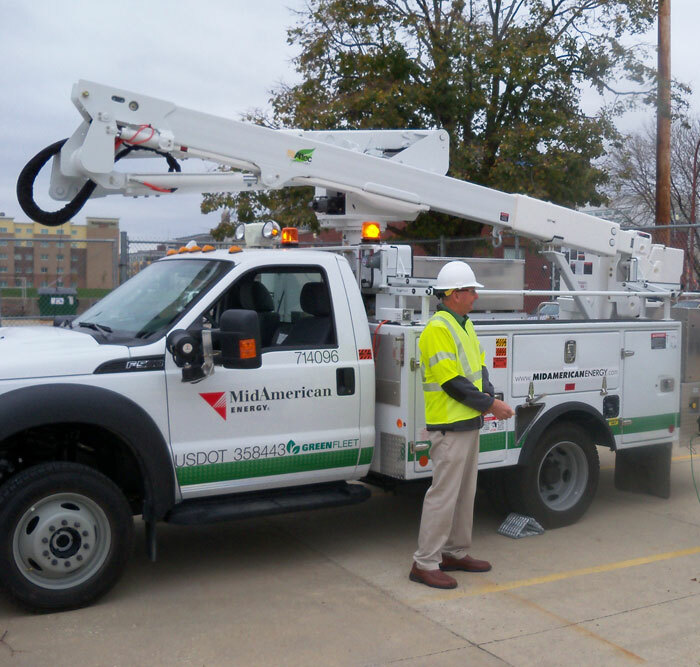 MidAmerican energy is adding some new trucks that use battery power to raise and lower workers in the boom to work on overhead power lines. Fleet manager, Brian Knights, says current trucks have to keep their engines running and burn fuel to power the hydraulic booms. “The new system will save us approximately one to two gallons per hour for every hour they don’t have to idle the truck to run the boom,” Knights explains. “In a normal day it’s estimated that an operator would idle their truck four hours a day for boom operation.” The on-board batteries take over when the truck’s engine is shut off. “The truck runs off a 48-volt battery system that drives an electric motor. The electric motor runs the hydraulic oil and runs the boom that way, as opposed to running your motor,” Knights says. He says saving fuel is one of the benefits of the electric system, as it also cuts down on vehicle emissions, reduces noise from the running motor, and cuts down on maintenance costs as the trucks engine is running fewer hours. Batteries on the trucks allow operators to shut off the engine and still use the boom. Knights says the new green trucks offer flexibility depending on the conditions they are used in. He says if there are problems created by extreme weather, they can disconnect the system and operate like a standard truck. The batteries are charged while the truck is moving between job sites or it can be plugged in overnight. The batteries can also power other operations on the truck, such as the lights. Knights says the new trucks cost 25 percent more than the old trucks, but the savings in fuel will cover those costs during the lifespan of the truck. He says most trucks run for 10 to 12 years before they are replaced. Knights says they will put eight of the trucks into service before the end of this year — five in Des Moines and three in the Quad Cities — and they eventually plan to replace all 100 of these types of trucks with the green models. He says the cost of the trucks is proprietary information they can’t release.